Otolaryngology Update: 3rd International Rhinoplasty Congress (Global Rhinoplasty Update-2019) to be held on Hotel Royal Orchid, Tonk Road, Jaipur on 20th & 21st April, 2019. 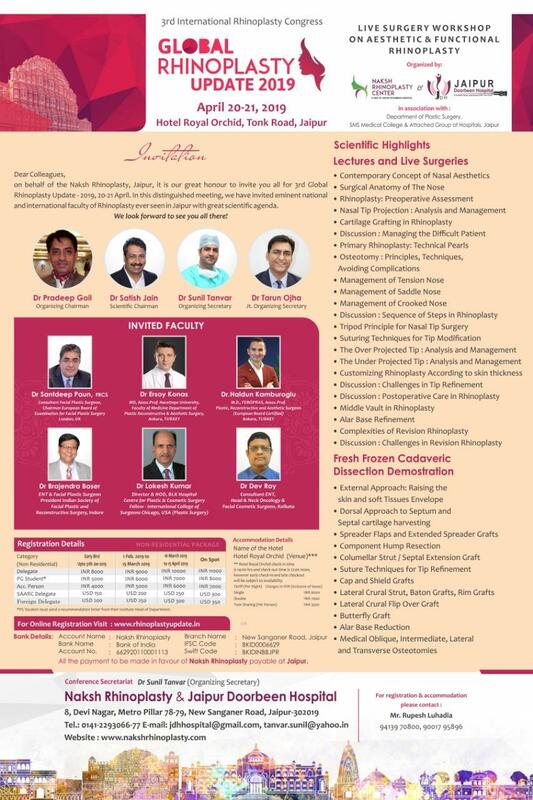 3rd International Rhinoplasty Congress (Global Rhinoplasty Update-2019) to be held on Hotel Royal Orchid, Tonk Road, Jaipur on 20th & 21st April, 2019. On behalf of the NAKSH Rhinoplasty Centre - Jaipur, it is a great honour to us warmly welcome you all 3rd International Rhinoplasty Congress (Global Rhinoplasty Update-2019) to be held on Hotel Royal Orchid, Tonk Road, Jaipur on 20th & 21st April, 2019. In this meeting, we have assembled the biggest national and international faculty on rhinoplasty ever seen in Jaipur with some of the most sought-after speakers. In this unique annual rhinoplasty meeting – you will learn how to analyze the nose, diagnose common and uncommon rhinoplasty problems and develop an individualized operative plan for different nasal deformities. The goal of the update is to give the attendees the tools needed to perform a rhinoplasty that produces the best functioning and aesthetic rhinoplasty result possible. The update is designed to take the participant from the basic fundamentals of rhinoplasty through the latest refinements and advancements in technique. It will consist of didactic lectures, panel discussions, question-and-answer periods and evening sessions.